What did one group of Jewish visitors do when confronted by a gang of Muslim extremists? 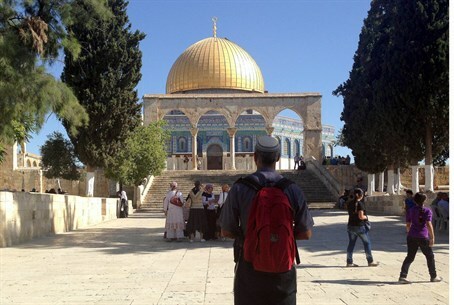 Jewish visitors to the Temple Mount have been facing mounting attacks and harassment by Islamist activists in recent months, as Muslim groups attempt to cement their control over Judaism's holiest site. But if a recent video taken by Islamist extremists is any indication (see below), Jewish activists remain as determined as ever - and are taking a decidedly defiant stance towards their antagonists. Although Muslim extremists often resort to violence in their attempts to keep Jews from the site - including regular riots and the recent shooting of Jewish Temple Mount activist Rabbi Yehuda Glick - the Islamist campaign also takes the form of low-level harassment of Jewish visitors by Islamist gangs. Known as the "Mourabitoun" (an Arabic term for guards who protect Muslim sites against heretics), the gangs are often comprised of religious Muslim women who attempt to intimidate Jewish worshipers by surrounding them while shrieking curses, shouting "Allahu Akbar" and occasionally assaulting them. Their self-proclaimed objective is to claim the entire holy site as part of the "Al Aqsa Mosque compound," after the mosque built on the ruins of two Jewish temples. They also claim to have been formed to prevent the Israeli government allowing Jews the right to pray on the Temple Mount, where they are currently banned from engaging in any act of worship in an attempt to stave off Islamist anger. In footage uploaded Sunday a group of Jewish men and women leaving the Temple Mount are greeted by a large group of Mourabitoun women chanting "Allahu Akbar." The video, which is now circulating around Arabic-language social media outlets, then shows the "strange" response of one of the Jewish men, who begins to dance. Soon, the initially surprised Jewish activists join in, defiantly singing songs expressing the ancient Jewish hope for a rebuilt Temple. The Mourabitoun are said to be financed by Hamas and the Hamas-linked Israeli Islamic Movement. Internal Security Minister Yitzhak Aharonovich began advancing a law to ban them for stoking violence though with the Knesset dissolved in anticipation of elections next year it is unclear when that bill will get the chance to be advanced into law. But whatever happens it is clear that efforts to intimidate Jews into abandoning their holiest site are not working - with a recent poll showing increased interest in visiting as a direct reaction to Muslim violence there.